Finally, Porsche applies its weight-ditching, track-focused philosophy to the models many believe to be the most fun P-cars on sale today. Topline: The Porsche 911 Carrera T was the enthusiast's sports car we'd always dreamed about, channeling the spirit of the original no-nonsense 911 T from the '60s to add a few key track-oriented mods like upgraded suspension and a limited-slip diff, and lose some weight to make it more fun. 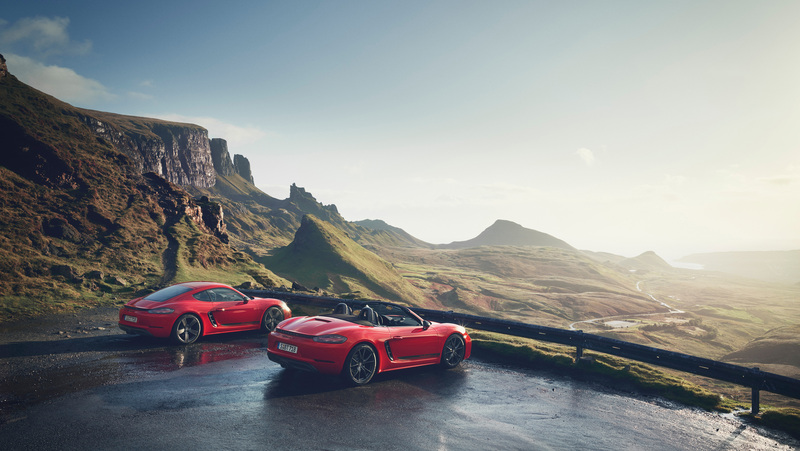 Now Porsche is applying that same perfect track-focused "Touring" philosophy to the best-handling cars it sells to make the two-seat 718 Boxster T and 718 Cayman T, and we can't wait. What's New: Both variants of the 718 T will come with Porsche's 295-horsepower, 280 pound-feet turbo flat-four right in the middle where even 911 stans know it really belongs. The key difference for the T models is how they're optioned, with a chassis that sits 20 millimeters lower than the regular car, 20-inch high-gloss titanium grey alloy wheels, agate grey mirror shells, a shorter gearshift that displays the gears in red on the top, and the Sport Chrono package—complete with its dashboard-mounted stopwatch—included. Selectable Normal, Sport, Sport Plus, and Individual drive modes included as part of the Sport Chrono package will let you make the car as savage or as street-worthy as you'd like, making this a car that you can enjoy both on the track as well as on your commute. (You may want to check the box for the radio if you're doing more of the latter, though.) Porsche even included their Porsche Active Drivetrain Mounts to minimize engine and transmission vibrations felt by the driver, and prevent those from upsetting the car when hooning around. 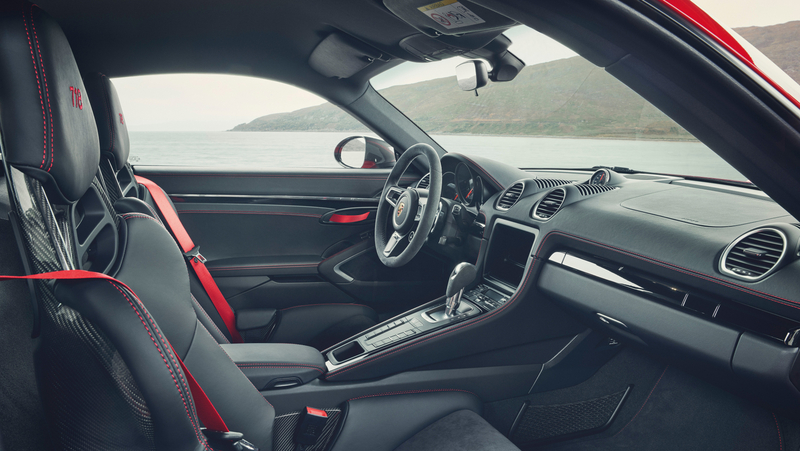 The interior continues the recent 911 Carrera T's no-nonsense tradition, with door pull straps in the door panels, a leather-wrapped 360-millimeter GT sports steering wheel and two-way electric adjustable sports seats that have the 718 logo embroidered into the headrests and grippy black Sport-Tex center sections. 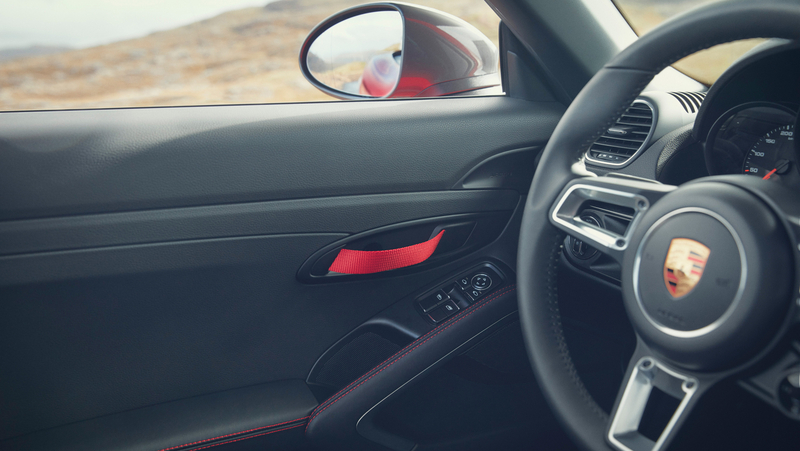 "Boxster T" or "Cayman T" logos appear on the black instrument dials as well as the door entry strips. The instrument panel and center console trim are finished out in glossy black—which is a magnet for fingerprints, but at least it's lightweight. As expected, you'll be able to spot these cars from afar with the retro-style "718 Cayman T" or "718 Boxster T" graphics down the side. If you want a special 718 T color, Porsche is offering Miami Blue and Lava Orange in addition to the usual black, white, Racing Yellow, Indian Red, Carrara White GT Silver Metallic, and Deep Black colors. 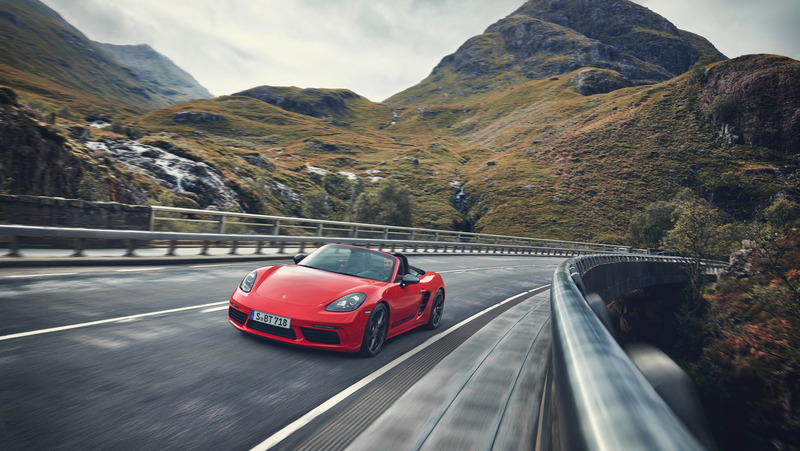 The 718 T also marks the first time the Porsche Active Suspension Management sports suspension has been offered with the twins' four-cylinder turbo. This is a trick electronic damping system that constantly adjusts the damping force on each corner of the car in response to driver behavior as well as road conditions. This is also part of why the 718 Ts sit just a bit lower than their non-T counterparts. 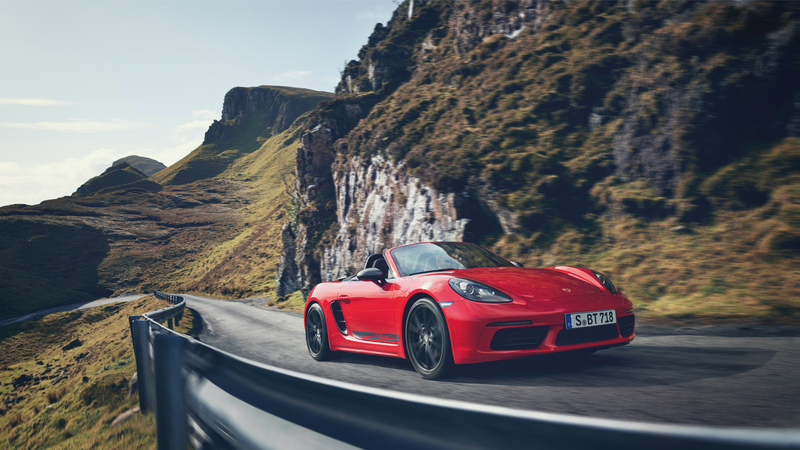 Both the 718 Boxster T and 718 Cayman T will get the six-speed manual transmission that all track Porsches truly deserve for maximum fun-having. The six-speed comes complete with Porsche Torque Vectoring, which includes a mechanical locking rear axle differential to maximize traction. Porsche's (admittedly brilliant, but less fun for the row-your-own set) dual-clutch transmission, the PDK, isn't standard on this one, but it is an option. Likewise, the Porsche Communication Management module doesn't come standard. A large storage bin sits in its place. You can add the entertainment system back in if you want at no extra charge, but do you really need to in a good little car that pops and crackles like this? I'm going to say no. 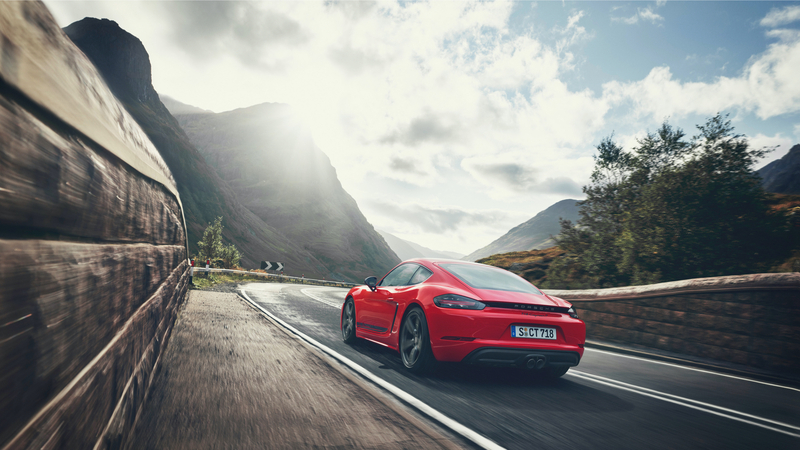 Porsche says that all the kit it's ditched from the 718 T balances out the extra weight of the gasoline particulate filter that's now required by the European Union to meet stricter emissions regulations. The whole package weighs just 2,976 pounds with the manual transmission, or 3,042 pounds with the PDK, and features a top speed of 171 miles per hour. What You Need To Know: The T-models are truly proof that Porsche loves us and wants us to be happy, often coming up in the same conversation as its more limited GT3 models for good reason. Yet they're more widely available as a regular model in the range. Now that there's a Touring version of the more affordable 718, it's truly the sports car for the people. 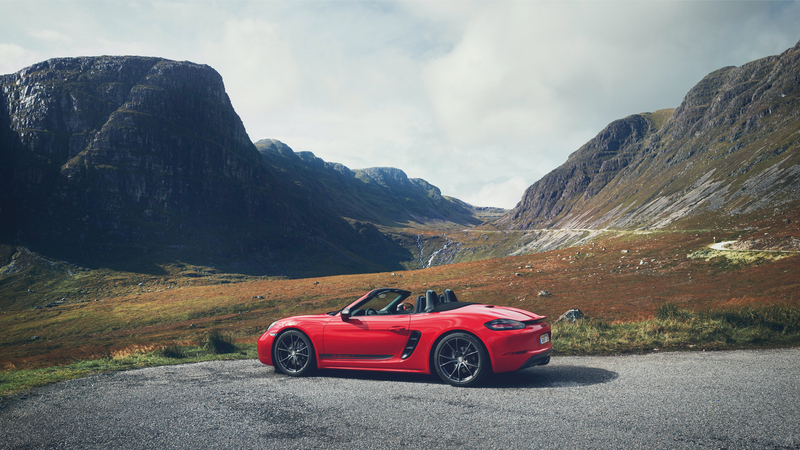 The 718 Ts are bound to be one of Porsche's recent hits. There's still a contingent of Porsche fans who believe in controlling as much as they can in a car over chasing the fastest lap times through trick technology and two-pedal setups. We're loud, we're vocal, and we're deeply unhappy whenever Porsche makes a hot model without three pedals. 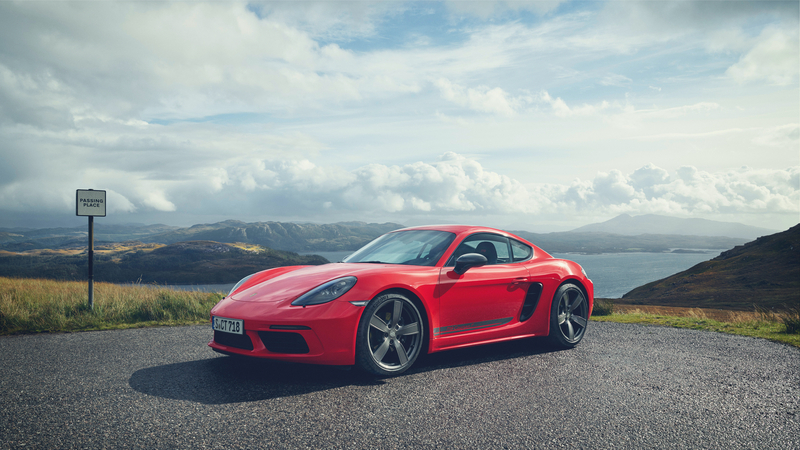 So, here's hoping the 718 T's six-speed doesn't suffer from the too-long gear ratios that owners criticized in the last-generation Cayman GT4. The 718 has always been the lighter, better-balanced sportscar in the Porsche range, and I can't wait to drive this new T. Few things on earth are more enjoyable than a stripped-down manual Porsche model meant for track hoonage. The track-focused 718 Cayman T will follow in the footsteps of the purist-special 911 Carrera T.